Hollyfield was a Dublin slum where the rejected, the derelict and the anti-social were housed. Young Martin Carhill grew up in a milieu where crime was the main occupation. He was sent to a correction school when caught stealing food for his family. Abused by priests and the police, he grew up with a resentment of authority. Throughout his adult life, Martin Carhillderived satisfaction from making fools out of authority figures. 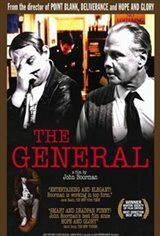 He organised a number of daring and carefully planned robberies, gaining the sobriquet, 'The General'. Hollyfield was a no-go area for the police and the fierce loyalties of its inhabitants protected Cahill. However, at the behest of his wife Frances and her sister Tina, he bought a house in the middle class district. He then came under the scrutiny of tax officials. He over-reached himself when he and his gang stole paintings from Russborough House. With public and political pressure mounting, the police started a surveillance operation headed by Ned Kenny, a man who admired Cahill but was determined to break him. His potent mix of violence and humour and generosity made him a legend in his lifetime, a legend that has grown largely since his death.